I usually don’t watch oldies, but the Record of Lodoss War OVA was a show that I had been wanting to finish for more than a decade. I probably saw the first one or two episodes of Lodoss back in 1995 when it aired on a Hong Kong TV station, and about a year later I watched that last two episodes after borrowing the video from the library. I must have been impressed or else I wouldn’t have remembered the show for so long, although after watching the video the show slipped off my mind until about two months ago when I discovered the show’s English name by chance. Although I’ve titled this post as a review, it’s more like a list of random thoughts on the show. 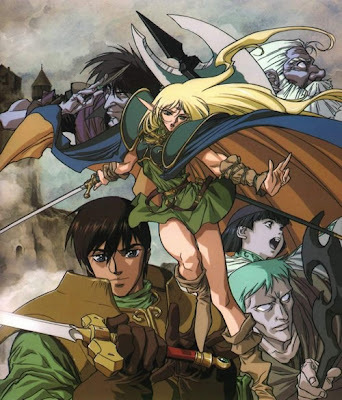 While I was intrigued by Lodoss 14 years ago, I can’t say I’m too impressed after watching all 13 episodes. Animated by Madhouse and released in 1990-1991, Record of Lodoss War is a medieval fantasy OVA series based a franchise of novels. Set on an island where kingdoms are constantly at war, the story of Lodoss is about a group of adventurers who tries to prevent the resurrection of an evil goddess. It’s a fairly typical story for the genre, and the show features a standard cast of fantasy characters including knights, elves, wizards and other beings of legend and lore. Out of all the heroes, the dwarf Ghim had the most interesting back story with trying to rescue a young woman who was possessed by an ancient witch. In comparison, the protagonist Parn was rather uninspiring. The problem with Parn doesn’t lie with his background; it lies with his lack of skills and growth. No matter who he is up against, Parn has only one strategy which is to charge forward recklessly despite being obviously outmatched, but he always survives either because someone saves his behind or because of blind luck. Not exactly what I would call an inspiring hero. It certainly didn’t help that I watched the English dub of the series and the voice acting for Parn and all of the other characters were horrible. The voices sounded tired and lacked emotion, and this made it even harder to like the characters. Another thing I disliked about Lodoss was the ordering of the events. The first episode starts off in the middle of the adventure with the heroes going on a journey to visit a sage, but on the second episode the story suddenly jumps back to the beginning with the heroes forming their group. A couple episodes later the story jumps over the sage visit that the heroes were going to in episode 1, and the visit to the sage is only touched upon later in a flashback. I understand that the story was laid out to the audience into the middle of the action in episode 1, but the jumping around makes the plot a little hard to follow and a simpler chronological approach might have been more effective. In trying to start off with a bang, Lodoss also set the bar too high for itself, as the first episode was better animated than all of the remaining episodes. Speaking of animation, the animation in Lodoss left a lot to be desired even when compared to other anime from that era. The show featured a lot of image stills, moving cutouts, and stock footage, and this is especially noticeable in a show where action is a prominent element. The worst offenders were the giant dragons that appear near the end of the series, and basically the dragons were giant cutouts that moved in and out across the screen. There were some stock footage of the dragons breathing fire, but that was it for the real animation. It’s really a shame since the dragons had such great designs. Unlike the animation, the character and creature designs in Lodoss were well-executed. I especially like the designs of the elf girls and Ashram. Ashram might not have much of a personality, but he was one cool customer in that shiny black armor. However, the nice designs do not make up for the lazy animation, and overall Lodoss‘ production quality was lacking. In conclusion, Record of Lodoss War was merely okay. The show had good designs, but the story and characters were average, and the animation needed improvement. The first episode was decent, but everything after that (including the end) was mediocre. I think the main reason why I remembered the show was because of the OP song, which was one of the genuinely good aspects of the show and was fitting for a medieval fantasy adventure. Too bad the show didn’t match up to the quality of the song. I don’t think I’m going to watch the sequels since this series didn’t quite live up to my expectations, but my expectations were probably too high due to my fuzzy memory.